I was hanging out in the secret garden taking it easy when I got a surprise goodie in the hopper. A chance to get a sneak peak at the latest Crime and the Forces of Evil project. Hey, I think these elf supervillains are pretty keen, so why not give their latest aural pastry a whirl? 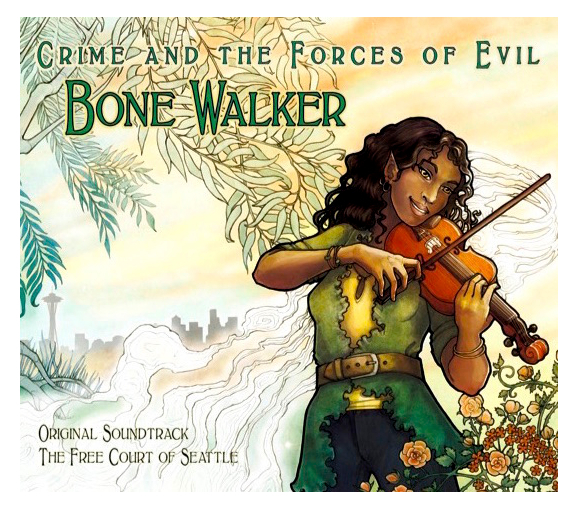 The goodie manifests in the form of Bone Walker: The Free Court of Seattle Official Soundtrack, a number of tracks available in digital or solid form as you please. It’s a collection of music to accompany a pair of urban fantasy books by author Angela Korra’ti—specifically Faerie Blood and the more recent Bone Walker. The liner notes mention struggles with complexity drift and unexpected delays. While it’s true that struggle is good for one’s art, I think it can also distract one’s focus. You need the adversity or you stop short of your best, but the other side of that is real risk–meaning you might actually miss a crucial ingredient or choice along the way. The splendid positives: A first rate package of materials–the tracks sound great and the artwork is gorgeous. The music is a wonderful assortment of mainly Irish tunes by professional musicians having a good time. These people know what they’re doing and it shows. For example, the songs “John Barbur” and “Lukey” really shine. I could imagine the main characters from the books hanging out and enjoying themselves in between their problems. It sells their complexity to me. I gotta say Leannan Sidhe can sing so sweetly she could charm a nest of devils. Dara Korra’ti’s vocals are as soft and as quick as a hare in all the right places. Sunnie Larsen’s fiddle cavorts with buoyant notes on “Lukey,” and resonates with unshakable dynamism on “Bring the Storm.” Easy to lose yourself in the moment with skill like this, it’s that marvelous. The not so exciting: The spoken word excerpts from the novels don’t work. The complex prose needs a different kind of reading and they’re too long–a minute at most would have been best, not 2-3 minutes. The mellow, enjoyable background music doesn’t fit the action scenes being read. For example, the Burke-Gilman Troll piece doesn’t match what I would imagine the reading was depicting. Way too laid back for a serious combat narrative. Same with the other readings. In “Bring the Storm” the dulcimer is exquisite, but it’s the wrong kind of sound for a supernatural fight with an angry dragon. The prose calls out for a lusher, more sophisticated sound with energy. There’s grace and wonder, but not enough fire and spice to be truly glorious. Listening to the last bonus track, “The Burke-Gilman Troll (Klopfenpop mix),” I glimpsed a direction many of the songs ought to have taken–less mild and laid back and more, well, Lord of the Dance-y. Here the music fits better with the scene selection, it has an edge. I can’t help but think it’s an opportunity that was almost realized. A soundtrack ought to evoke the quality of the medium and type of story it accompanies. The overriding message of this collection is a laid back adventure that doesn’t match the whole picture. It’s more of a promo piece than a soundtrack, and that’s too bad. I know Crime and the Forces of Evil are capable of more. The Diamond Island is powered by	WordPress 4.9.10 and delivered to you in 0.666 seconds using 28 queries.